We’re going to talk some more about the digital assistants put out by Amazon and Google. Those would be the Amazon “Echo” and Google “Home.” They are small, relatively cheap (from $50 to $129), and they answer questions and do requests. This is the future. This is all new stuff, the edge of wedge if you will. It’s potentially an encyclopedia on your end table, along with lectures, songs, weather, books and history. Some of it will be dead wrong, just as some items in Wikipedia are wrong. This will all get edited and corrected along the way, hopefully, but right now it is what it is, as the Zen Buddhists might say. The potential is both enormous and obvious. LG recently paired a refrigerator with Amazon’s Alexa, the voice inside Echo, and you tell it what you want delivered. But don’t wait for the fridge, you can do that now with the Echo or Echo Dot. Just tell it what you want; not just food but for your whole life: books, clothes, furniture, electronics, tools, news, movies, and on into the night. Just ask and they will check your credit card and deliver. The number of businesses and jobs that will be wiped out by this technology may lower many people’s credit ultimately, but that’s the way things crumble, to paraphrase a common saying. If you have a Chromecast or Amazon Fire Stick, ($30 to $40), you can cast a movie, TV show, or news shots onto your TV by voice command. Later — and probably not much later — we can expect the little boxes to come with cameras as well as microphones. They could take your picture and estimate the correct size and color for your wardrobe. Now some of the people we have shown these gadgets to, and talked about their potential, are worried about their privacy. Well, a lot of people are worried about their privacy, but we fail to see the threat here: You can always turn the little box off. The counter argument of course, is that it may be possible for someone outside to hack in and turn it on without your knowledge. Definitely; it is absolutely possible. The final defense is simple enough: drape a hand towel over it. Now that we’ve had more time with the Amazon “Echo Dot” (The cheapest version of their information device) and Google “Home,” we’ve noticed some differences. It’s hard to say “Hey Boo Boo” with a straight face, and it works best if you say it softly, not too clearly, so that it sounds like you’re saying “Google” but have marbles in your mouth, or have lost some of your marbles. The Amazon Dot gets music from Amazon Music, iHeart Radio, TuneIn Radio, Pandora and, if you’re a premium subscriber, from Spotify. Bob says that’s not enough, though we haven’t yet added Spotify. If we ask for music from Bach, for example, Alexa plays a pop version of some Baroque tune. It works better to ask her for Baroque music, but Bob is dissatisfied with the recordings so far. In any event, this is the future. We mentioned the tie-in with Amazon and an LG refrigerator. 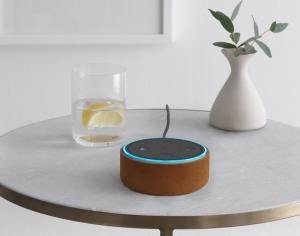 New connections are coming in fast: The “Nucleus Anywhere Intercom” gives you all the existing abilities of Alexa and adds phone calls, either as an intercom or to the outside world: “Alexa, call Uncle Max.” Likewise, a chef’s “sous vide” system from ChefSteps tells you how to control your cooking with ziplock bags, using water at various temperatures. There are also Alexa-enabled lighting systems, weather stations and a universal remote from Logitech. The Logitech “Harmony Elite” ($300) works with over 270,000 devices: It lets you use your voice to control your TV, satellite or cable box, Apple TV, Roku, TiVo, Blu-ray player, game consoles, connected lights, locks, thermostats, sensors and so on. Even as we wrote this column we received notice of a new link to control your burglar alarm system. In conclusion: Watch what you say and don’t walk around naked.